LAFAYETTE, Colo., Nov. 13, 2018 -- urban-gro, Inc., a leading systems integrator and agriculture technology firm serving commercial cultivators around the world, will be presenting a cultivation virtual reality experience and live demo of Soleil Sensors to the global cannabis industry at MJBizCon being held at the Convention Center in Las Vegas, Nevada November 14-16. The Virtual Reality experience, powered by Transported, will allow conference participants to explore the technical considerations of a Los Angeles cultivation facility’s irrigation, flower, and veg rooms. This experience will demonstrate urban-gro’s cultivation design and system expertise that includes professionally designed layouts for irrigation, climate control, benches, fans, and lighting to ensure optimal space utilization and product performance. Additionally, their Soleil Environmental Control systems, powered by Total Grow Control, will be on display to demonstrate the data-driven microclimate intelligence using high-density sense and control technology to improve crop quality, consistency, and operational efficiencies. 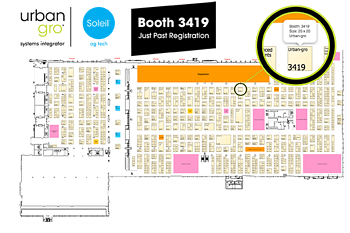 urban-gro experts will be on hand in Booth #3419 to answer questions regarding Soleil Technologies and urban-gro’s systems integration solutions. urban-gro is a leading systems integrator and agriculture technology firm focused on serving commercial cultivators around the world. The company’s ag tech division, Soleil Technologies, delivers data-driven microclimate intelligence using high-density sense and control technology to improve crop quality, consistency, and operational efficiencies. By combining its design and integration services, industry-leading suite of cultivation equipment and crop management products, and proprietary technology solutions, urban-gro provides solutions for today’s commercial cannabis cultivators to efficiently manage their cultivation operations. urban-gro is recognized as one of the cannabis industry’s fastest growing systems integration and agricultural technology companies. Visit www.urban-gro.com and www.soleiltech.ag to learn more. Follow us on Instagram, Facebook, Twitter and LinkedIn.